What is with the new Mountain Dew Logo. WHY has it been changed. It is so ugly. Why change for the sake of change. Why change what needs not be changed. And what is with the (MTN) anyway. I feel like I'm going to a ski resort or something. From my visual survey, this Facebook group's membership encompasses almost exclusively white, teen-aged males - Mountain Dew's (excuse me, Mtn Dew's) target audience. I'm certain Pepsi performed lots of market research before making this change, but it still strikes me as another example of branding influenced by the internal machinations of a company. As I wrote in my entry about HLN (Headline News), it's just plain dumb to rename companies or products based on how you refer to them internally. For years, I'm sure every Pepsico staffer has referred to the company's super-caffeinated, lemon-lime soda as Mtn Dew, but that doesn't mean anyone else should. As one member named Brian writes, "mtn dew can diaf!!!" (Translation for the middle aged like myself: Mountain Dew can die in a fire!!!) We'll see if Pepsi suffers the repercussions of changing the brand fourth most popular soda in the world (Coke, Pepsi, and Diet Coke come first). But I concur with the Facebook group. Why change something that need not be changed? What i dont understand is why you'd take the time to write an article about the mountain dew logo. Its obviously the companies decision whether or not they want to change the logo. and sometimes things do need changing. you cant just leave everything the same for years and years. maybe they changed their target market when they changed the logo of mountain dew. She is just sharing her opinion about the new logo. 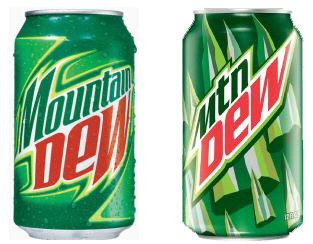 Me personally, I like the old logo a lot better because the name of the drink is "Mountain Dew" not "Mtn Dew".